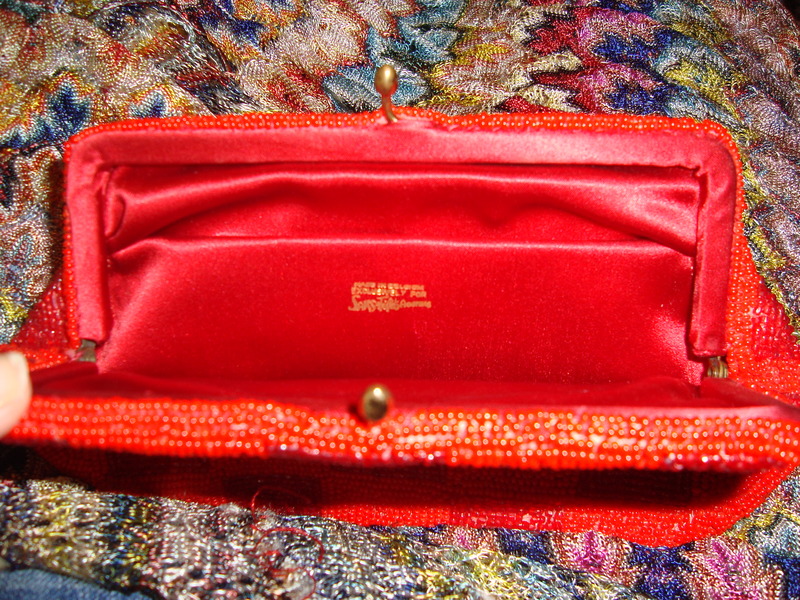 Fashion Crap: Vintage beaded purses, anyone? 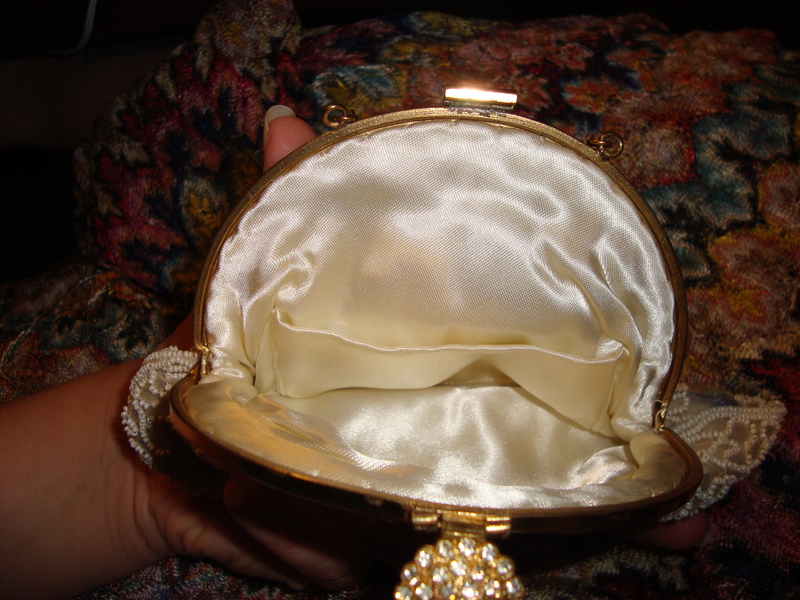 So nearly a year ago I promised to piggyback my antique jewelry post with a look at some of my spiffy vintage beaded purses. Most of these purses came from my grandfather, the king of pawns and master of the Bay Area flea market. It’s also possible that one or two of them belonged to my great-aunt Alice. 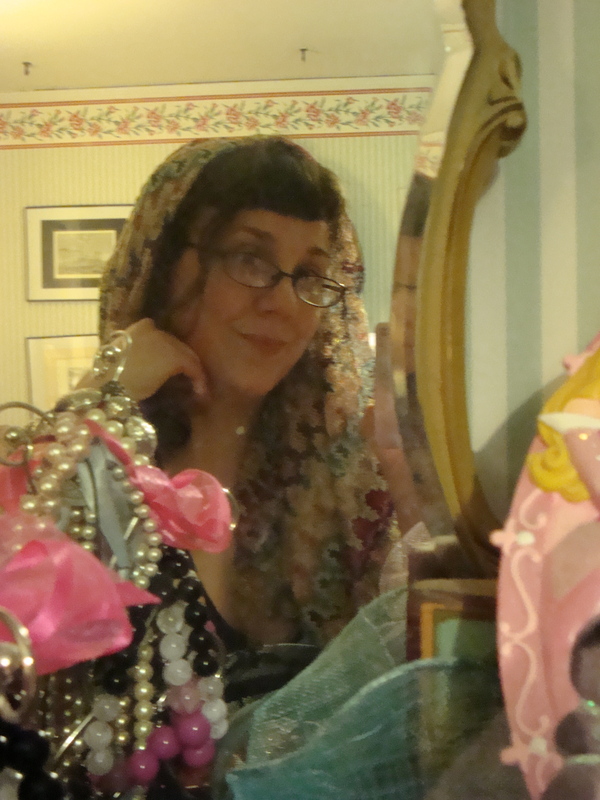 But FIRST, my awesome silk shawl from the 1920s. This is the famous Shawlhead shawl, ifyouknowwhatImean. Kali in 1920s silk shawl. Photo by Lani Teshima. 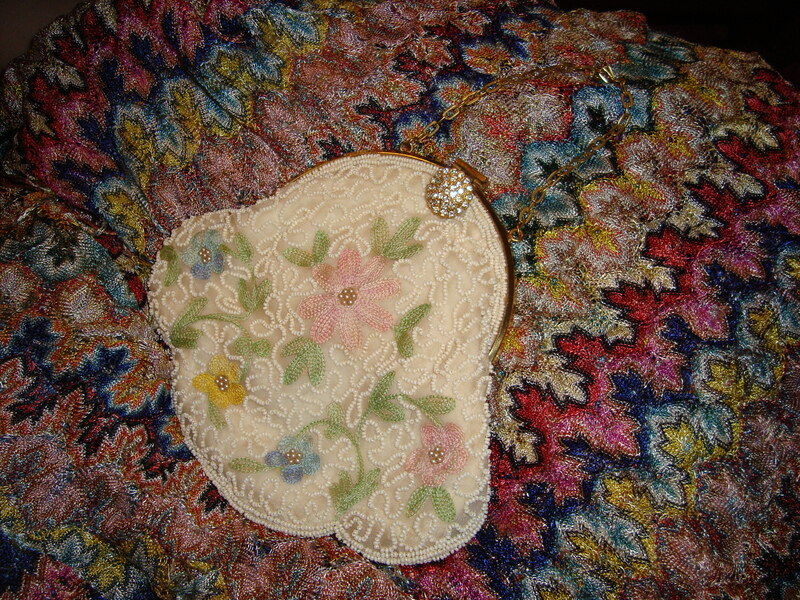 Small flowered purse with beading. 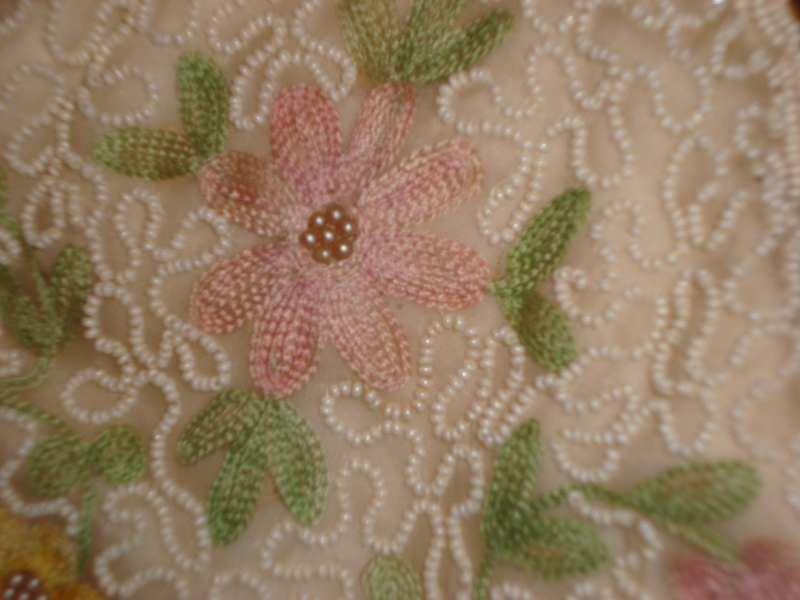 White purse embroidery and beading detail. 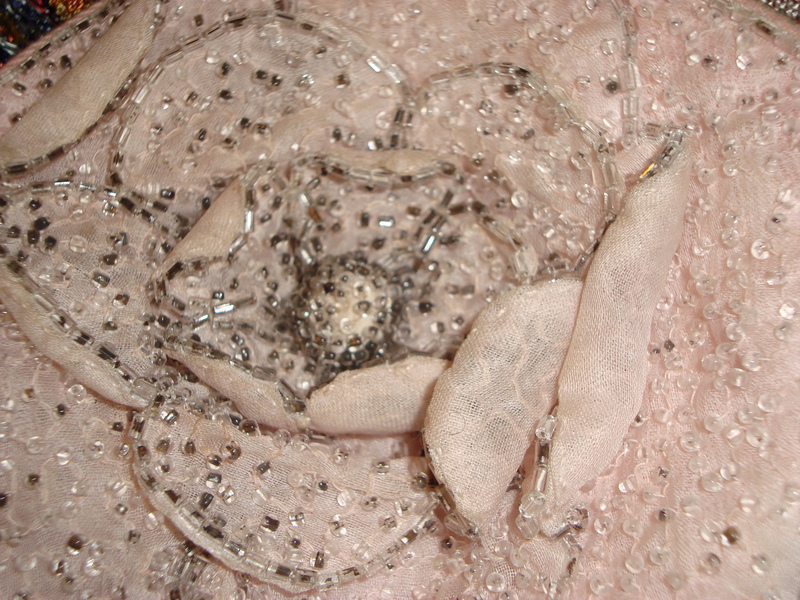 Satin lining in the white beaded purse. 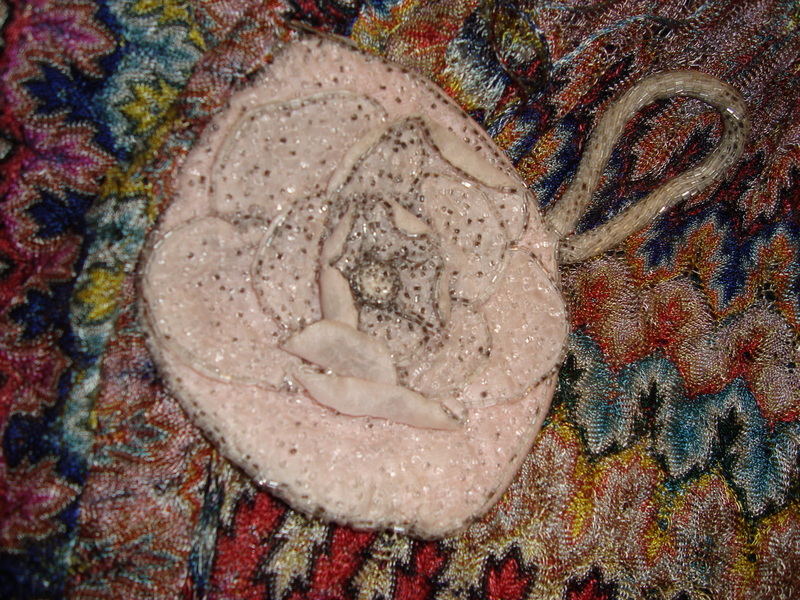 And now, a pretty pink wristlet/coin purse with beaded petals! Light-colored, transparent beads are interspersed with pewter-colored metallic beads on this lovely Belgian creation. 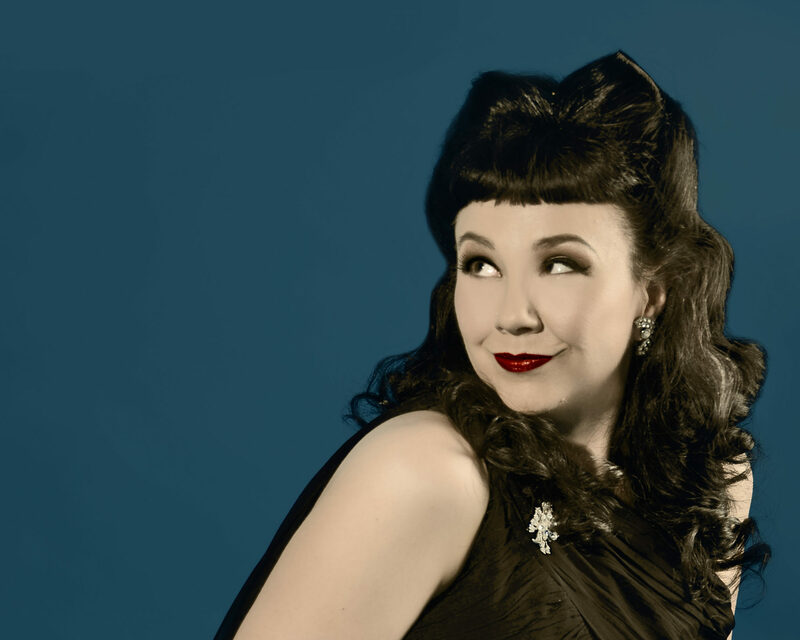 Looks like early sixties, or maybe even late fifties, to me. 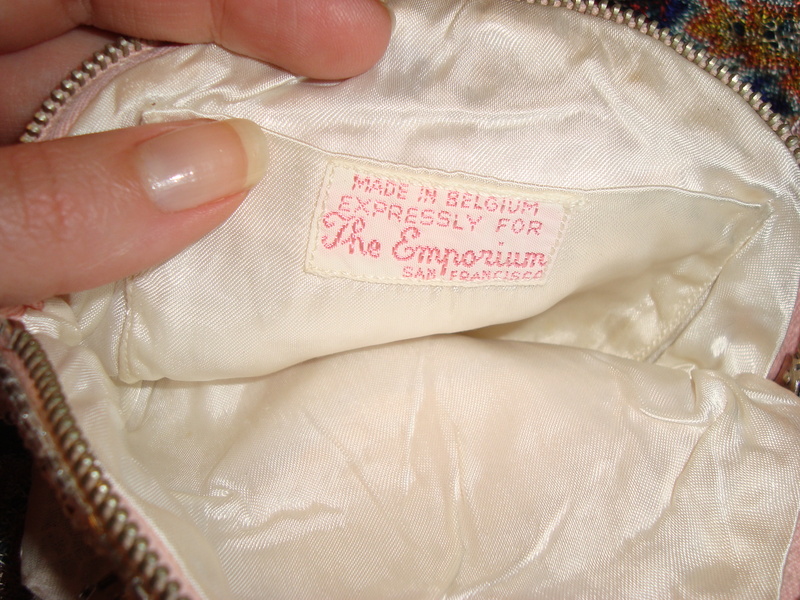 Inside the pink flower purse: Made in Belgium expressly for the Emporium, San Francisco! 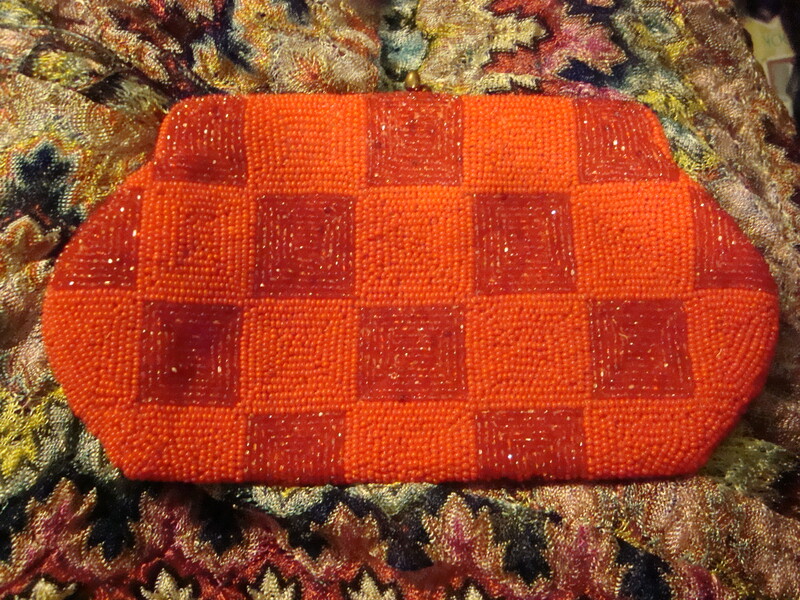 Red and orange beaded purse from Saks Fifth Avenue. 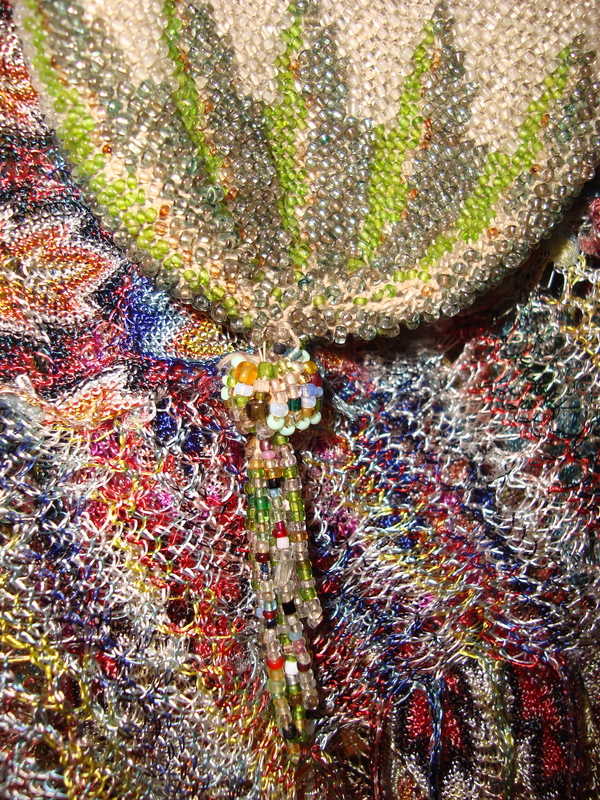 Beading Detail. 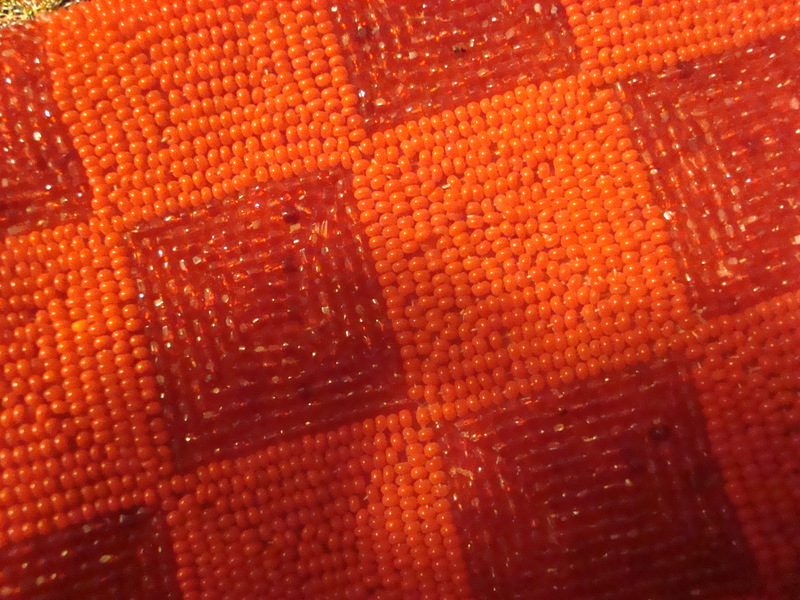 There are gaps in the bead rows, but I'm not sure that any beads are actually missing. The lining says Saks Fifth Avenue. 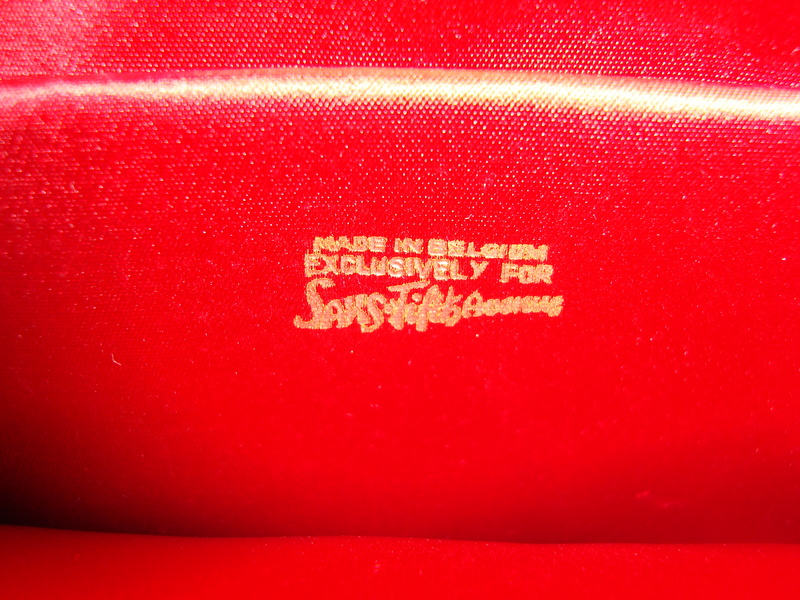 Inside the red Saks purse. 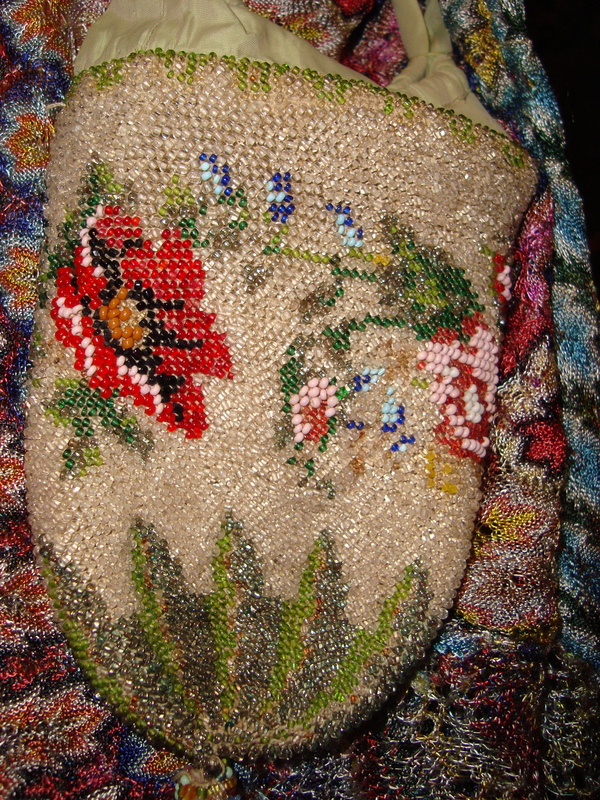 And finally, what looks to be a 1920s, or even teens, reticule. It’s possible that the fabric top, drawstring, and lining are replacement, but I can’t tell for sure. 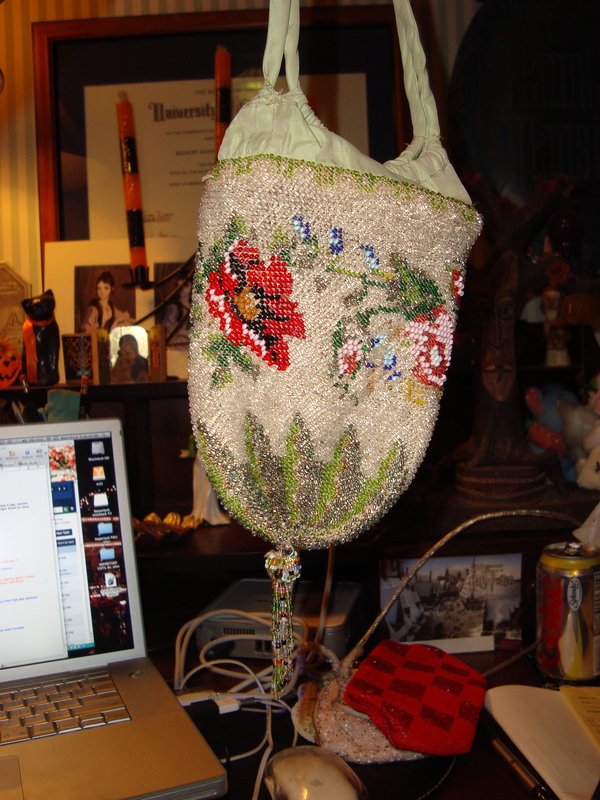 The full beaded reticule, more or less. And that’s it for now! There are other purses, but I felt they weren’t as interesting as these. 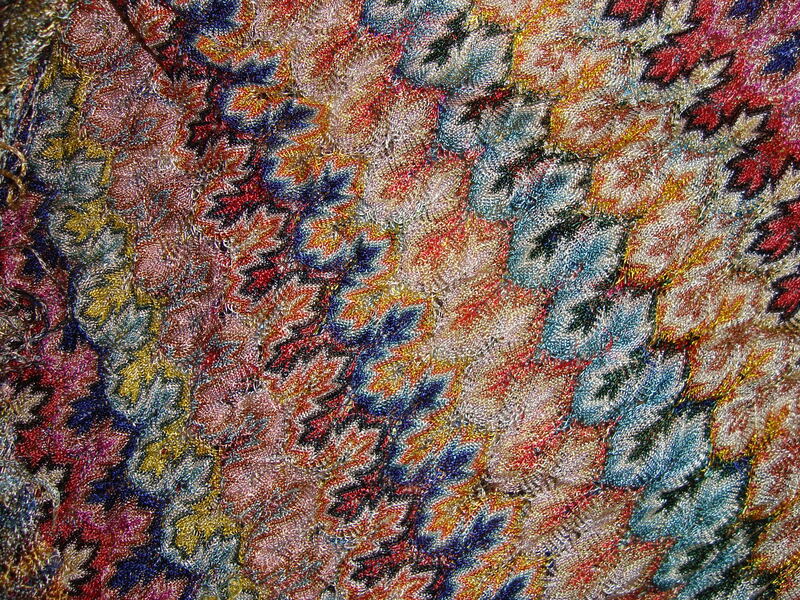 I love that shawl, very Missoni! What a collection of beaded purses, very nice. Pingback: Outfit of the Day! Birthday Edition Part One... | . : StrangeBlog :. Pingback: Fall fashion color review & wishlist: Because Labor Day is OVER! | . : StrangeBlog :. Pingback: Outfit of the Day: New Year's Eve Fashion! | . : StrangeBlog :. Previous PostPrevious This is Haunted Halloween!